When something rubs repeatedly against your skin it can cause painful corns, calluses and blisters. Corns and calluses are thickened areas of skin that form in response to repeated pressure or friction. When you apply a protective covering, it helps reduce pressure and friction so corns and calluses can heal. 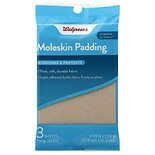 One of the easiest and most effective ways to protect corns and calluses from further friction is with moleskin. Moleskin is a soft cotton fabric you place over a corn or callus - or anywhere you need extra cushioning. The back of the fabric contains a sticky material that holds it in place. Once it's properly applied, the area stays protected for hours as you walk around and carry out your normal activities. Moleskin can also be used to prevent friction that could lead to a painful blister on a foot or toe. It's good to have some on hand if you're athletic or do a lot of walking, hiking or running. Moleskin is easy to apply. Just trim the moleskin sheet to the proper size. Then remove the backing and apply it to the area that needs cushioning. Always apply moleskin to clean, dry skin. This creates a strong bond between the adhesive and the skin. Moleskin padding is also available in strips you can cut to any size. Use it to cushion existing calluses or corns or to prevent new ones. For prevention, simply place it over areas where you typically experience friction for extra cushioning. You can also apply it to the insides of your shoes to reduce friction and pressure. Moleskin kits are also available. These kits are equipped with different sized padded dressings you can easily apply to your feet or toes. Some have pre-cut holes for blisters. The pre-cut hole reduces pressure on the blister while the surrounding padding cushions it. These kits contain everything you need to protect your feet including alcohol wipes to clean the skin beforehand. If you have an active lifestyle, it's nice to know you can protect your feet from painful corns, calluses and blisters with moleskin.